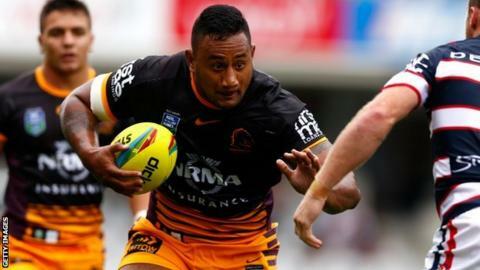 Australian rugby league player Francis Molo has returned to the sport, two months after a tackle that led to the death of another player. Sunshine Coast Falcons' James Ackerman, 25, died on 22 June, two days after the tackle from Norths Devils' Molo. The 20-year-old has not faced any blame or criticism following the tragedy, but was suspended for eight weeks. Molo returned for the Devils, a feeder team for NRL side Brisbane Broncos, in an Intrust Super Cup game on Sunday. The game - a 40-22 defeat by Tweed Head Seagulls - took place at Bishop Park, the same venue where Ackerman was injured in June. Molo had been reportedly considering quitting the sport following the incident, despite being assured by Ackerman's family that he was not to blame.